Hard work, anticipation and an unpredictable outcome. Steve Ballmer, the former CEO of Microsoft, (MSFT) is finding that owning a basketball team isn't so different from running a tech company. Ballmer bought the Los Angeles Clippers in August for a record $2 billion -- and Thursday is the season opener against the Oklahoma City Thunder. "It's a product launch for all intents and purposes," Ballmer said at a Wall Street Journal tech conference in Laguna Beach, Calif. "You have no control over the outcome." "You can build a great product, you can give it all the good marketing, you can tune it, you can tweak it, you can worry about it -- but we still gotta win the darn game tomorrow night for this story to have a good next chapter." Ballmer, who is still Microsoft's largest individual shareholder (with no plans to sell), said he's far from abandoning his role in the tech industry. "I've learned as much about machine learning in the last three months getting ready for the Clipper home opener as I did in the last three months I was at Microsoft," said Ballmer, referring to a partnership with an L.A.-based startup that will use the arena's cameras to analyze plays and engage attendees. "We've got stuff with tech that we're absolutely doing," he added. But the excitable executive is looking forward to other things, too. 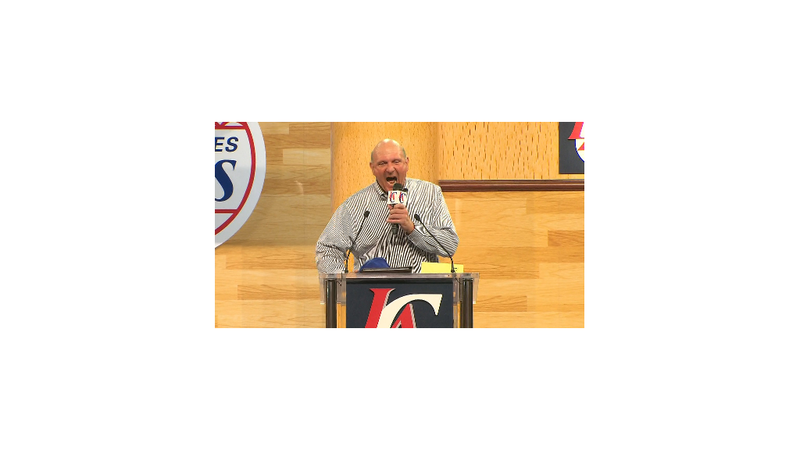 "Fergie's going to sing the national anthem," said Ballmer, who broke out in her new song, "L.A. Love" at the announcement. "La la la la la," he sang.